Nash Huang's dark journey comes to a conclusion when 'No. 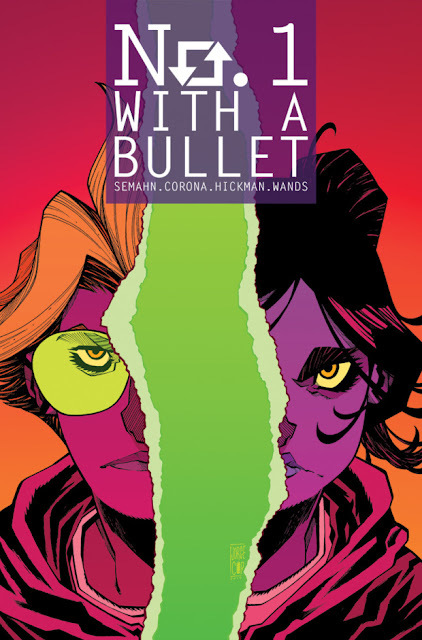 1 With A Bullet' #6 closes out the miniseries in shocking fashion. An unflinching look at exploitative social media culture, stalking, invasive technology, suspense, murder, and mystery all come to a head as Nash comes face-to-face with her number one fan. Bound and blindfolded, Nash is frightened and confused listening to her captor explain the reasons that brought them together. It's a riveting sequence of events with the captor kept in silhouette while Nash is kept in close-up adding to the tension. Jorge Corona invokes some of the masters of suspense like Alfred Hitchcock and Brian DePalma in the way he frames the action, revealing only enough to keep you glued to the page. Jacob Semahn transitions from the horrors of cyber-bullying and shaming to old-fashioned thrills and chills when Nash must fight to survive her stalker. Semahn finds a way to bring the story full circle delving deep into emotional beats from primal fear to sentimental love. All the while, Nash is in the eye of the storm as the chaos swirls around her until finally sucking her in, testing her will and challenging her very being. How she responds is what makes this finale so satisfying. Equally compelling is Jen Hickman's use of color to demonstrate those emotions some in some very hostile situations. Nash's fiery red-faced rage, the sudden brightness of a lamp illuminating a room, the sweet lavender palette of cherished memories, Hickman wrings every bit of emotion from every scene. 'No. 1 With A Bullet' found a way to tackle tough subjects like sexual exploitation and cyberstalking and craft a suspenseful thought-provoking crime thriller out of it. Semahn, Corona, and Hickman have shed light on all-too-common real-life horrors through the lens of comics creating a powerful story that's timely and emotionally charged. They close out the series in an exciting fashion that satisfies.